Established since 1999, we are one of the longest standing and most trusted small removal companies in Brighton & Hove and throughout Sussex. Man-with-a-van.com specialise in moving flats and small houses, along with an optional full packing and unpacking service. We also undertake small office removals, runs to and from self-storage and most other reasonable requests. Our friendly and efficient removal teams have professional knowhow and expertise. 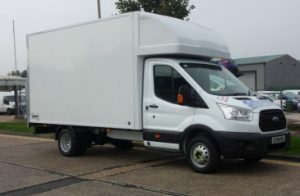 Whether we have supplied you with 1 man and a Transit van, or a 2 man Luton van removals team, loading a removal van is a skill and an art-form, in which we take great care and pride. Man-with-a-van.com have been trusted and recommended since 1999. Our removal vans come equipped with high quality soft wool transit blankets and webbing ties to protect your items during transport. Training certificates from the British Association of Removers for Health & Safety and house packing are available for your inspection upon request. We also carry £20,000 of goods in transit insurance, just in case. Q. Do you supply boxes and packing materials? A. No. We recommend you contact Simon at www.brighton-boxes.co.uk for all your removal box and packing material requirements. They deliver quickly and offer a quality product at a bargain price. If you are not sure what to order, just ask. Q. Do you offer a packing service? A. Yes. Having trained at the British Association of Removers, we are delighted to offer a full packing, and if required, an unpacking service too. Simply order the removal boxes and packing materials to be delivered prior to our arrival, and we will take care of the rest. Q. Do you clear rubbish or do Tip runs? A. No. If you need this type of service or have items you no longer require, please contact Tom Berry at mrhouseclearance.co.uk. A. No, however, if you require a piano to be moved as part of a full home removal, then we will contract in expert Piano people. Q. Do you offer a discount to OAP’s? A. Yes. We are delighted to offer a 10% discount to OAP’s. If you are in particularly good condition for your years, we may ask to see ID! Q. Can you handle large moves, such as a 5 bedroom house? A. Yes we can. Our services are completely scalable. Q. Do you only work locally, or do you go further afield? A. We are happy to move you to or from Brighton & Hove to anywhere in the UK. Bristol, London, Manchester – no problem!